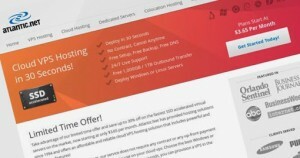 Web Hosting Services – ORLANDO, FL – Atlantic.Net, a world-class cloud VPS hosting solutions provider, is now offering a SSD Cloud Platform to new and existing customers. The Enterprise SSD’s (Solid State Drives) are up to 100 times faster than the previous storage solution provided to the company’s customers. This enables Atlantic.Net customers faster start-up time, random access time, data transfer rate and read performance. Atlantic.Net’s Cloud VPS Hosting plans start at only $0.005 per hour (or $3.65 per month), with usage calculated on a per second basis. For a limited time, Atlantic.Net is offering up to 30% off all Cloud VPS plans including backup and 1TB outbound data transfer included on every server. For more information, please visit http://www.atlantic.net/promotions/vps-up-to-30-percent-off/. This new environment represents complete reengineering, utilizing the latest and most stable virtualization technologies and Enterprise Solid State Drives. The new SSD Cloud Platform features updated core networking, with new switches and routers, and new 32 and 64-bit Operating System images for Windows and Linux Cloud Servers.